Citizens support better rights for domestic workers on Salary, Maternity Leaves etc. 26th May 2018, New Delhi: India has around 5 million fulltime domestic workers, more than half of which are women. Finding a domestic help could be an expensive task in the west due to all the rules, regulations and policies that have been set for their welfare. But that is not the case in India. The issues of domestic workers are plenty, ranging from being over worked to being under paid, to being fleeced by placement agents and many a times in trouble when they are faced with a health emergency. 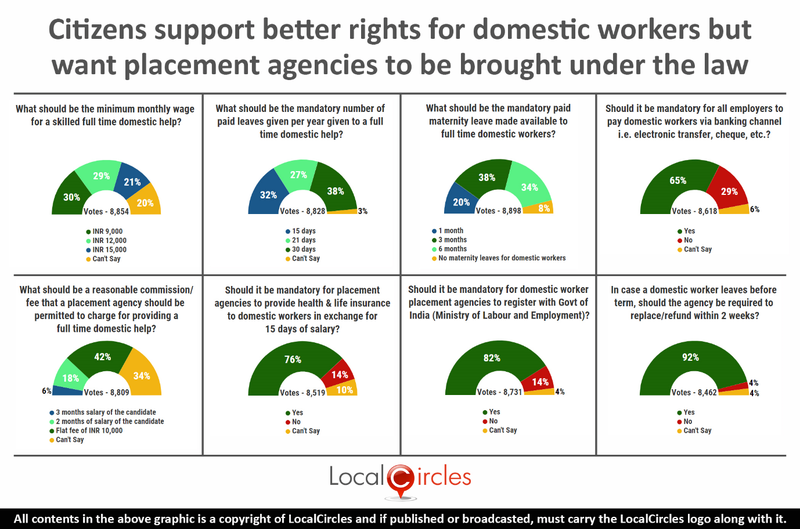 As the Government is finally getting to make a law that protects the interests of domestic workers, LocalCircles decided to dig deep on what people think should be done to improve the working conditions of full time domestic helps. The 8-poll survey received more than 68,000 votes. 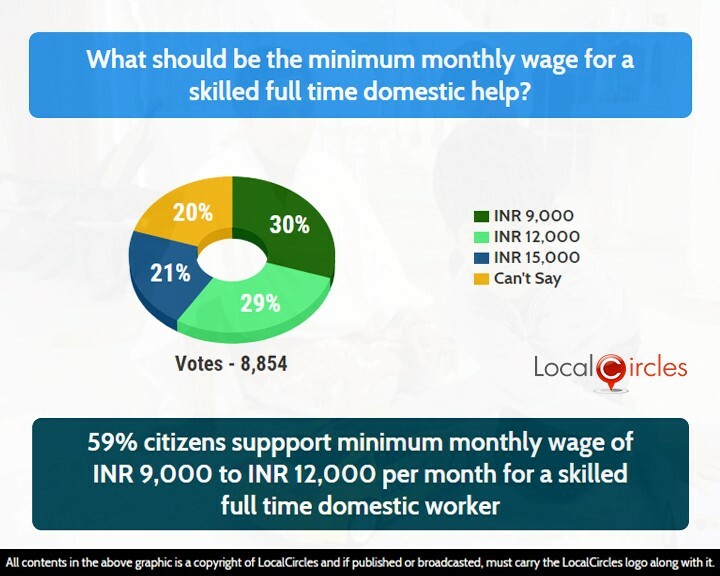 The first question asked people what the minimum monthly wage for a skilled full time domestic help should be. 30% said it should be Rs. 9000, 29% said Rs. 12000 and 21% said Rs. 15,000. 20% were unsure. Reports of exploitation of domestic helps is not unheard of. Cases of domestic helps being brought to metros from villages and being paid less than Rs. 5000 a month are a common occurrence. 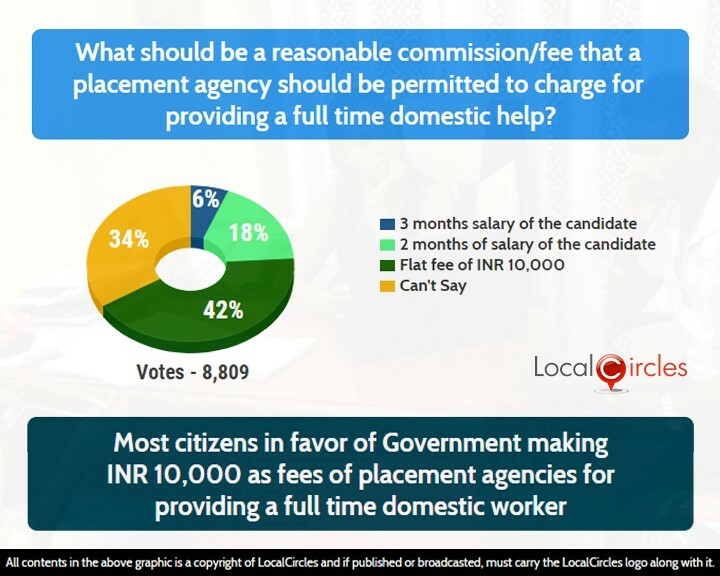 The second poll asked what should be a reasonable commission/fee that a placement agency should be permitted to charge for providing a full time domestic help. 42% said it should be a flat fee of Rs. 10,000 while 18% said it should be 2 months’ salary of the candidate. 6% said it should be 3 months’ salary and 34% could not decide. 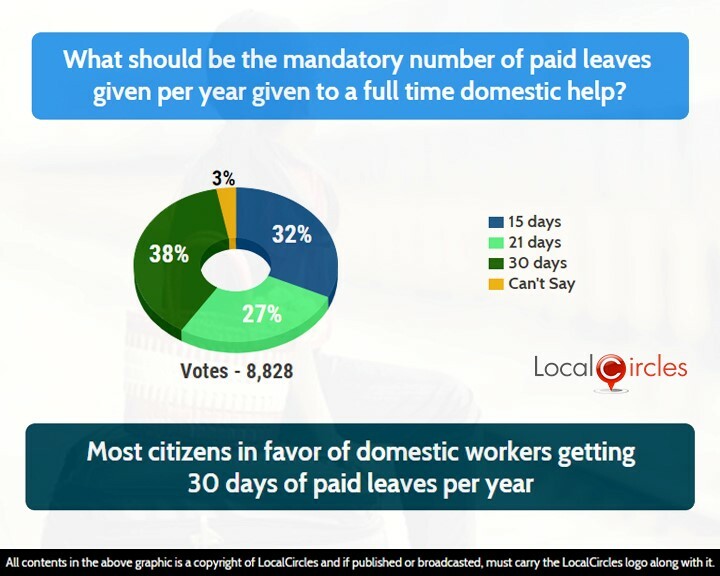 The next poll asked what the mandatory number of paid leaves should be given per year to a full time domestic help. 38% voted for 30 days, 27% said 21 days, 32% said 15 days while 3% were unsure. The Ministry of Labour and Employment is in the process of finalising a policy for domestic workers which would give them a right to minimum wages and ensure their welfare. This policy will also include domestic workers in the existing legislation and give them rights to form their own unions and associations. 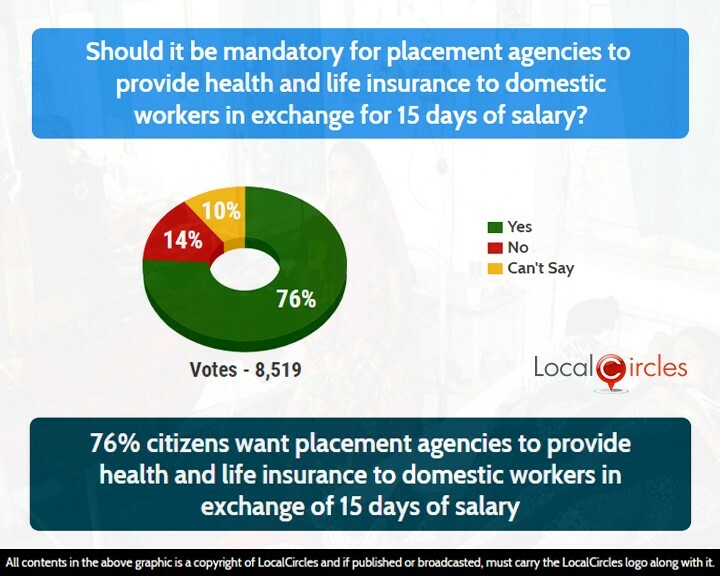 In the following questions, 76% citizens want placement agencies to provide health and life insurance to domestic workers in exchange of 15 days of salary. 14% said it should not be mandatory while 10% chose to stay neutral. Domestic helps are usually left to fend for themselves in case they become ill, with most of them being unable to afford modern medicines and expensive diagnostic tests. 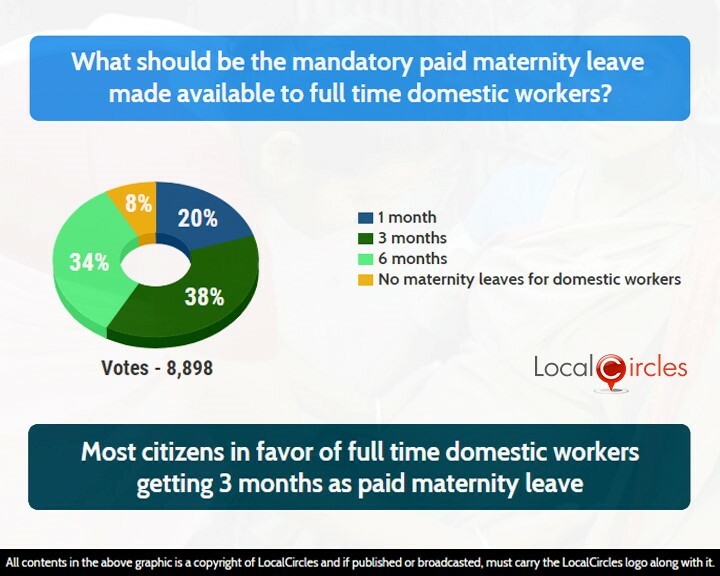 When asked what should be the mandatory paid maternity leave made available to full time domestic workers, 38% said 3 months. 20% said 1 month while 34% said 6 months. Only 8% said no maternity leaves should be given to domestic workers. After the recent amendment of the maternity bill increase the maternity leaves from 3 to 6 months, it is natural that the full time domestic helps are also legally allowed a proper maternity leave. 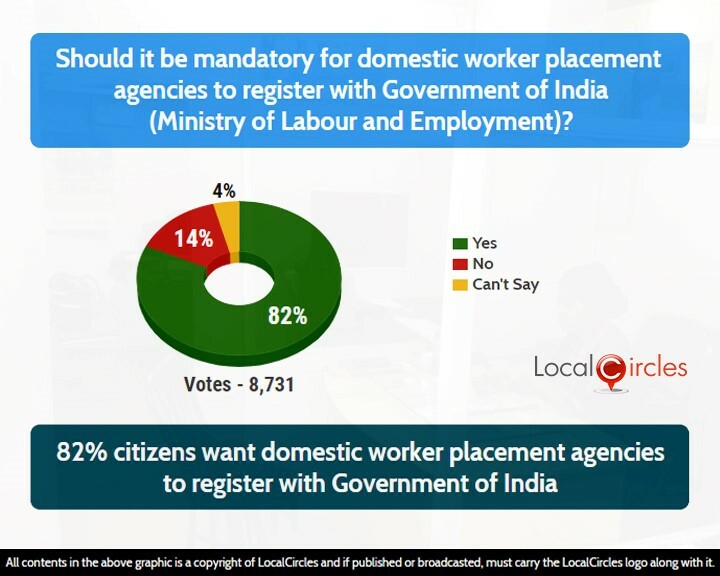 On asking whether it should be made mandatory of the domestic worker placement agencies to register with the Ministry of Labour & Employment, 82% said yes while 14% said no. The registration of placement agencies with the Ministry of Labour and Employment will considerably reduce the cases of fraud committed with many consumers by fly-by-night domestic help placement agencies. 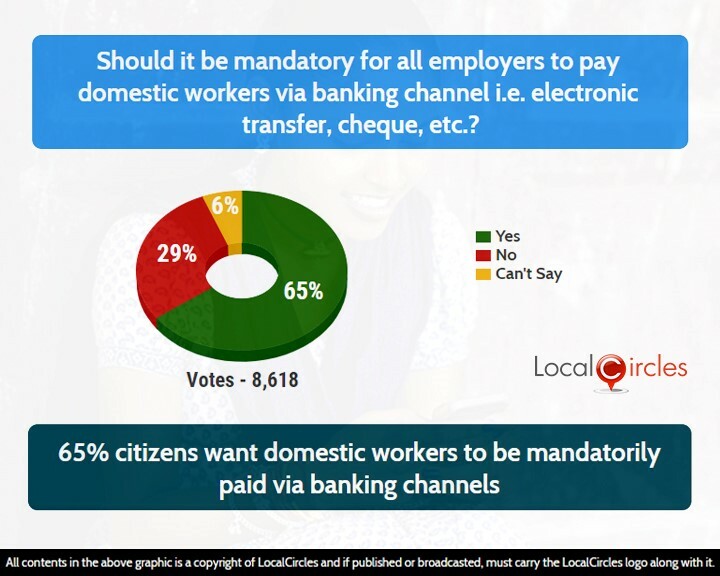 The penultimate question asked if it should be mandatory for all employers to pay domestic workers via banking channel, 65% agreed while 29% disagreed. 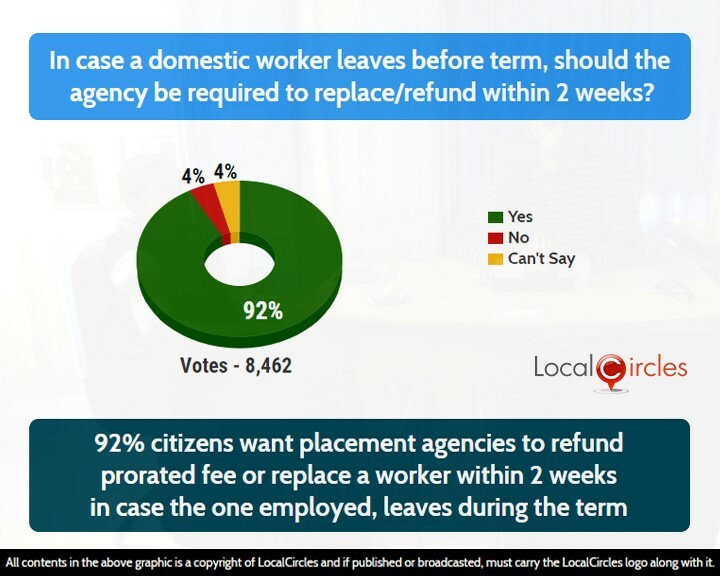 In the final poll, 92% citizens said the wanted placement agencies to refund prorated fee or replace a worker within 2 weeks in case the one employed leaves during the term. Just 4% were against this. The Union Minister of State for Labour and Employment recently said that his ministry was conducting discussions and keen to receive citizen feedback on a Policy for Domestic Workers. 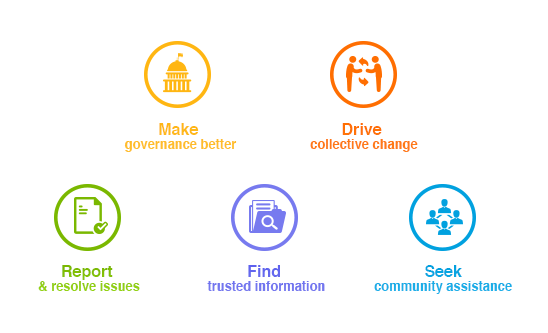 Citizens believe that if the above feedback is incorporated, this policy will be beneficial for domestic workers and will protect them from abuse and exploitation. Many of the State Governments like Rajasthan, Kerala, Punjab, Tamil Nadu and Tripura have included domestic workers in the schedule of the Minimum Wages Act.